I did win the chair. I got into a bit of a bidding frenzy, and it cost £89.01. I took the wise counsel of a friend who thought it was worth £200, and when I was looking at the Conran Shop website yesterday, I noticed that a lot of the chairs were mighty expensive. So, that's what I was using as a benchmark. 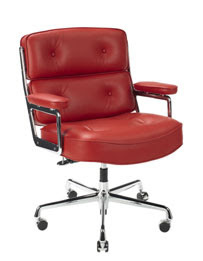 The Eames ES104 Lobby Chair above costs £3,890. So £89.01 for a chair is just spare change, right? Considering I saved myself £40 on a postcard, that's really only £49.01. Late last night, I became obsessed with the idea that someone had artificially inflated the price and that the seller had prompted someone to bid against me. I mean, who lists a nice chair at 99p with no reserve? And does anyone really bid for those pick-up only items? Shortly after I placed my first bid, five days ago, some anonymous bidder came out of the woodwork and pushed up the price. Don't more experienced bidders know you have to wait until the final seconds to swoop in? Is that red chair in the picture your new chair? It's VERY cool. I would have been so excited for you to discover an eBay fraud---I'm a bit of a conspiracy theorist myself and would be proud to say I know a real live crimefighting eBay superhero! Can't wait to see the bookshelf!